Wilcox noted the Third Lanark side would “include a number of players from other teams…owing to some of the regulars not being in a position to spare time to make the trip.” The team was thus more correctly referred to as the “All-Scots,” despite it being referred to as Third Lanark in most U.S. newspaper reports. However, while the tour had the approval of the Scottish FA, the team was not endorsed by the SFA as a national team side. In the event, while four Third Lanark players would be with the team, eleven players came from seven other Scottish clubs, six from the Scottish first division (Partick Thistle, Motherwell, Dumbarton, Aberdeen, Ayr United, and Albion Rovers) and one from the Central Football League (Dunfermline Athletic), which because of its independent status could offer players higher wages than the maximum allowed to teams in Scottish League play. Conspicuously absent were any players from Rangers, Celtic, Heart of Midlothian, or Dundee, the top four teams in the first division after the 1920-1921 season. Prior to the tour, five of the players had appeared for Scotland in international play, and one player would do so after the tour. With the First World War ravaging Europe through the heart of the 1910s, no international side had visited the U.S. since the 1911 Corinthians tour. More importantly from a competitive standpoint, the All-Scots tour would be the first ever in the U.S. by a team made up of professional players. Equally important from an organizational standpoint, it would be the first-ever domestic tour by an international team to take place under the auspices United States Football Association (USFA), known today as the United States Soccer Federation, which had approved the tour at its annual meeting on May 25, 1921, held that year at the Hotel Walton in Philadelphia, located on the southeast corner of Broad Street and Locust Street. Thomas Cahill was given the responsibility of making arrangements for the U.S. portion of the tour. Wilcox expected the team would be “the strongest aggregation ever sent here.” He wasn’t wrong. Leaving Liverpool for Canada aboard the Cunard liner Cameronia on May 11, 1921, the Scots began the first part of their tour with a 7-0 win over Halifax on May 25. 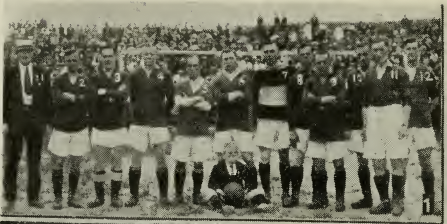 A month and a half later, having sometimes played in the red colors of Third Lanark, other times in a white jersey bearing a thistle that evoked the kit worn by previous Scotland national team sides, they finished the Canadian portion of the tour with a 1-0 win over a Canada XI team in Montreal on July 9. Undefeated through 19 games, they had outscored their opponents 87 goals to 9, with 11 shutout victories. In New Jersey a day later on July 10, the Scots faced Jersey City Celtics, described by Spalding’s Official Soccer Football Guide for 1921-1922 as a team “composed of players recruited from clubs around New York,” in their first game in the U.S. Despite a “splendid exhibition” from Celtics — and two hours of heavy rain immediately before the start of play — the Scots defeated the home side, 4-2. It was only the second time in the tour the visitors gave up more than one goal. Next up were Bethlehem Steel followed by the All-Philadelphia team. The Philadelphia area had hosted its first international friendly on October 8, 1901 when a “Gentlemen of Philadelphia” team made up of players from the city’s cricket clubs faced “Bosanquet’s XI,” an English cricket team then touring the U.S., at West Philadelphia’s Belmont Cricket Club in a game of soccer. While the local team lost, 6-0, the game was widely covered in the local press and helped to boost interest in soccer, which was still recovering from a downturn following the economic crisis of the mid 1890s, increasing support of soccer among the city’s class of Anglophile elites. Teams were formed throughout the area, including one backed by Connie Mack of baseball’s Philadelphia Athletics, to join the city’s now growing roster of leagues. That positive momentum was furthered when the touring English amateur side The Pilgrims came to Philadelphia for three games in October of 1905. The local sides again showed their inexperience and the Pilgrims won by a cumulative total of 19 goals to 1, defeating an All-Cricket Club League Best XI 4-1 on October 6 before breezing past an All-Philadelphia team made up of league players 5-0 on October 7, and then trouncing a team made up University of Pennsylvania students and alumni 10-0 on October 24. Crowds had been strong for each game — the Inquirer reported that attendance for the All-Philadelphia match on October 7 “was estimated to be around 15,000 persons” — and interest from area soccer fans in seeing the game played at its highest level was plainly evident. The All-Philadelphia team fared better when, only weeks after the Pilgrims’ visit, the University of Toronto team arrived in Philadelphia for three games, winning the first game 3-0 on November 30. The All-Cricket Club League team was defeated 4-1 by the Canadian visitors on December 1, with the University of Pennsylvania team losing 5-1 the next day. The next year in 1906, England’s famous Corinthians team, another amateur side, toured the U.S., stopping in Philadelphia for three games. They were easy winners in each game, defeating the All-Cricket Club team 6-0 on August 31, 1906, the Albion team 9-0 on September 1, and the All-Philadelphia team 12-0 on September 3. Corinthians against All Cricket Club XI at Merion Cricket Club, August 31, 1906. Photo courtesy of Rob Cavillini. Both the Pilgrims and Corinthians would return to the U.S. for tours. In 1909, the Pilgrims again played three games in Philadelphia, defeating an Associated Cricket Clubs League team 3-0 on November 2, 1909 before crushing an All-Philadelphia side 9-0 on November 6. Remarkably, Philadelphia’s Hibernian team defeated the visitors 1-0 on November 4, the English side’s first loss of the tour. Corinthians returned in 1911. The American Football Association had prohibited member clubs and players from facing the English team so this time there was only one game in Philadelphia, against an All-Cricket Club side. The U.S. soccer landscape had changed dramatically since the 1911 Corinthians tour. The USFA had been formed in 1913 and soon gained official recognition from FIFA. The inaugural edition of the National Challenge Cup, now known as the U.S. Open Cup, had also been launched in 1913 and was well on the way to replacing the AFA’s American Cup tournament as the country’s premier — and truly national — soccer tournament. After Bethlehem Steel had passed on the offer, the USFA had sent its first official national team side on a Scandinavian tour in 1916, finishing with a respectable 3–1–2 record, 1–0–1 in full internationals. 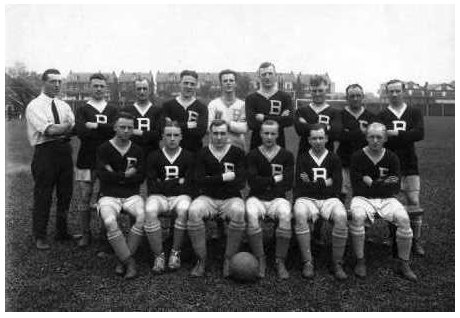 Bethlehem Steel had embarked on a Scandinavian tour of its own in 1919, becoming the first U.S. professional club side to tour outside of the U.S., finishing with a 7–2–5 record, outscoring their opponents 22–14. A St. Louis team followed Bethlehem Steel to Scandinavia in 1920, also returning home with a 7–2–5 record. By the time of the arrival of the All-Scots, work was underway for the debut of the American Soccer League, the country’s first fully professional Division I league, for the 1921-1922 season. By 1921, Bethlehem had laid down its claim as being the top team in the country. After joining Philadelphia’s Allied Amateur Football Association in 1912 — winning the league championship in its first year, adding another league championship as well as the Allied Amateur Cup and the American Football Associations American Cup in its second year — the team joined Philadelphia’s American League of Association Football Clubs for the 1914-15 season, winning the league championship and it’s first U.S. Open Cup. By 1921, it had added three more U.S. Open Cup titles to its list of achievements, as well as four more American Cup titles, and three straight championships in the semi-professional National Association Football League. 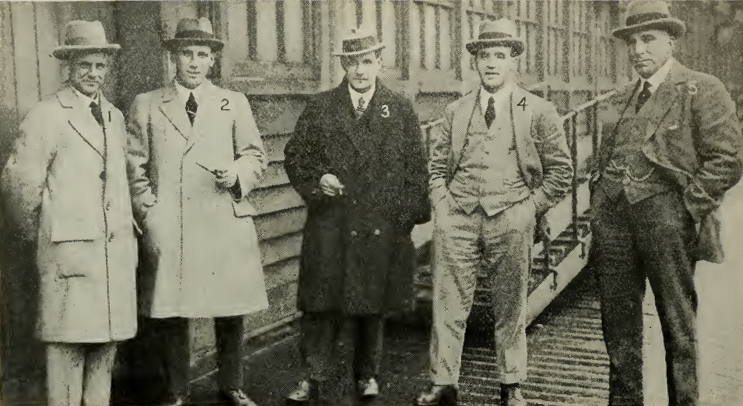 All Scots (L-R) Alf Bennett (Albion Rovers), Jimmy Gordon (Scotland, Dunfermline Athletic), – Andy Wilson (Scotland, Dunfermline Athletic), Jim McMenemy (Scotland, Partick Thistle), and Jimmy Brownlie (Scotland, Third Lanark). From Spalding’s Official Soccer Football Guide for 1921-1922. A thorough canvass of the shops of local industrial plants and business houses in the Lehigh Valley will also be made in the near future. Secretary A. H. Buck of the Bethlehem Chamber of Commerce will also lead the cooperation of that body, by requesting all business men to close their establishments an hour earlier than usual in order to allow employees to witness the game which will start at 5:30 p.m. 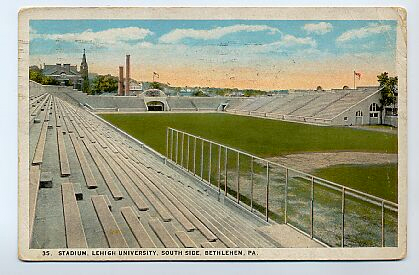 Indeed, expectations for a big crowd were such that the game, which would be played on a Wednesday, would take place at Lehigh University’s Taylor Stadium rather than the team’s own Steel Field. Lehigh University’s Taylor Stadium. Photo courtesy of Dan Morrison/bethlehemsteelsoccer.org. 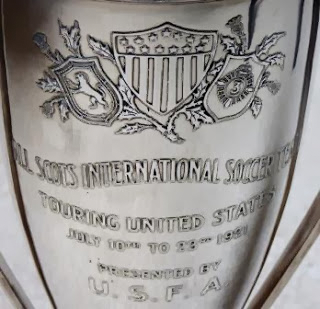 The All-Scots did make six changes when they lined up against Bethlehem Steel on July 13 and for the first 45 minutes of the game, the home team’s scouting of their international opponents seemed to pay off. In the opening minute of the game Bethlehem outside left Tommy Fleming delivered a hard shot. Third Lanark and Scottish international goalkeeper Jimmy Brownlie, described by the Globe as “the best custodian in Europe,” slipped and fell as he moved to cover the shot, which struck the crossbar before going out of play. It would be Fleming who opened the scoring with what the Globe reported was a “low drive into the corner of the net,” and the 3,000 fans on hand for the game “went wild with enthusiasm” after the hometown goal. Four minutes later, Aberdeen outside right Doug Thompson equalized for the visitors when his shot “was poorly handled” by Bethlehem goalkeeper Duncan. Play continued evenly after that and the scoreline stood at 1-1 at the end of the half. In the second half, the All-Scots proceeded to run over Bethlehem. Eight minutes after the start of the second half, Partick Thistle and Scotland inside right Jim McMenemy gave the visitors the 2-1 lead. A few minutes later, a headed goal from Dunfermline Athletic and Scotland center forward Andy Wilson made it 3-1. The Globe reported, “The Scotchmen seemed to have complete control of the situation and they gave a demonstration of football superior to anything ever seen in this country. The ball was passed from player to player with such precision and accuracy that the spectators simply marveled at the exhibition.” Soon Thompson scored again for the visitors, followed by another goal from Wilson. Dunfermline Athletic inside left Tom Maxwell added another goal to make it 6-1 before Wilson and Thompson each added another goal to complete individual hat tricks. At the final whistle it was Bethlehem Steel 1-8 All-Scots. The Globe described, “Spectators who witnessed the play in the first half could not understand the catastrophe which took place in the last thirty minutes. The team hardly appeared to be the same that started against the Scotchmen.” It was Bethlehem’s worst defeat since the fall of 1907 when the team was downed 11-2 and 9-0 by West Hudson in the span of a few weeks. 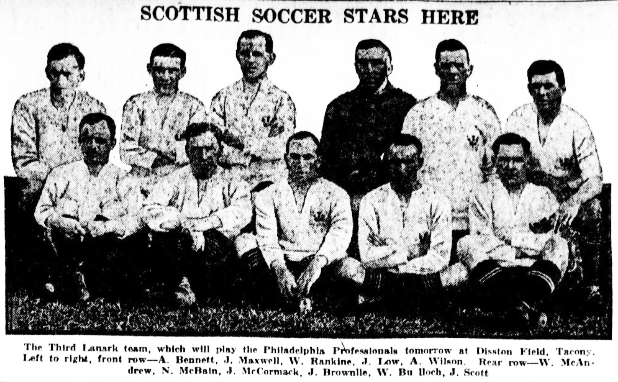 The All-Scots arrived in Philadelphia on Friday, July 15, the day before their match against the All-Philadelphia team at Disston Ball Park, located at State Road and Unruh Street in the city’s Tacony section. After a sightseeing tour of the city, the team had a short practice at Disston Park. The day of the game they were treated to an early banquet at the Manufacturer’s Club. Kickoff on July 16 was scheduled for 6 pm, Levi Wilcox describing in the Philadelphia Inquirer’s match preview published the day of the game, “That time having been arranged so that it will give those interested in baseball a chance in which to witness their favorite pastime and then attend the soccer match.” The scheduling was both a smart and realistic move, as evidenced by the opening sentence of the match preview in the Philadelphia Public Ledger on July 16, which began, “Soccer enthusiasts in this city, and they number thousands, will get their long-looked-for opportunity this afternoon…” While Philadelphia was without question one of the premier soccer centers in the U.S., plenty of readers needed to be reminded of soccer’s strong local following. The scheduling consideration seemed to payoff for Wilcox described in the Inquirer’s July 17 match report that “the biggest crowd that has attended a game in this city since the visit of the English Pilgrims” turned out to see the All-Scots. In the event, five Philadelphia-based players were added to the All-Philadelphia starting XI: Disston goalkeeper Johnny Ness, right fullback Bobby Bethune, Disston winger Percy Andrews, and Bart and Jim McGhee brothers, two brothers who played as forwards for Wolfenden-Shore in the city’s Industrial League. The visitors made one change to their lineup, starting Motherwell’s Willie Rankin at inside right over McMenemy. 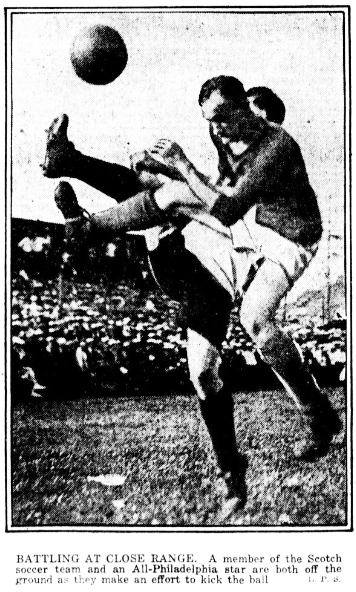 Right from the re-start, Wilcox reported, the All-Scots “started bombarding the Phillies’ citadel.” Center halfback Rutherford “in attempting to ‘trap’ the sphere, had the misfortune to foul” Motherwell inside right Willie Rankin. Scottish international center forward Andy Wilson made no mistake from the penalty spot to make it 1-1 four minutes after All-Philadelphia’s goal. The Scotchmen’s second tally resulted after one of the finest exhibitions of dribbling seen since the invasion of the English Corinthians and Pilgrims. The Scotch front liners were fed by Brown around the half-way mark and by a series of passing, repassing, and smart dribbling on the part of Wilson and Company, Rankin banged the ball into the net from a corking shot about twenty yards out which was labeled all the way, from which it may be gathered that Ness did not have the least chance in which to connect with the shot. It was the All-Scots’ 22nd consecutive win. 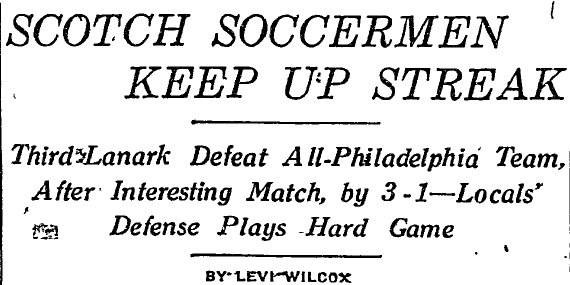 Headline of Philadelphia Inquirer match report, July 17, 1921. The analysis of the game by Wilcox at the Inquirer provided more nuance. Although defeated, the Philadelphia team was not humiliated. They played a whale of a game, to use the words of one of their most ardent admirers, while at some stages of the game they even outplayed their more experienced rivals. One of the most outstanding features in connection with the Scots game noticeable more than ever [in their win over Bethlehem] is the formation of the team for various plays. It is not necessary for the captain to coach his players on the field for the purpose of ‘tipping’ them off for the next play as they all seem to have that instinct what to expect, or where the pass is going every time that one of the Scotchmen has the ball at his feet. In both periods, play was of a fast order. The short passing game, compared to the long slinging passing game of the Phillies, giving the spectator the two style of game, with the Scotchmen showing the most finish, particularly in the forwards, where their passing, repassing, and dribbling left nothing to be desired. Unlike the All-Scots, who were nearing the end of a long tour together, the All-Philadelphia players were in the middle of their offseason, not to mention a team that, irrespective of the Bethlehem Steel core of players, featured an aggregation of attacking players who had never played together before their game at Disston Park. To his credit, Wilcox did not mention this obvious fact. What was more important was conveying the understanding that the All-Scots represented a level of quality not present in the American game. Through the efforts of the management of the Bethlehem F. C., local and Philadelphia fans were enabled to witness the game far cheaper than in any of the other four cities where the Scots appeared. The prices in Philadelphia and Bethlehem — 50 cents for general admission and $1 for reservations — were lower than those in New York, Jersey City, Lynn, Mass., and Fall River, where the scale was $1 for general admission, $1.50 and $2 for reservations. The receipts for the local game, it is understood, totaled in the neighborhood of $2,000 while those in Philadelphia were a trifle over $3,000. Deducting the 75 percent privilege, together with the expense of advertising, transportation and the hundred and one other incidentals that cropped up, the local management was fortunate if it broke even in the games played in Bethlehem and Philadelphia. The All-Scots team that faced New York FC on July 17, 1921. From Spalding’s Official Soccer Football Guide for 1921-1922. 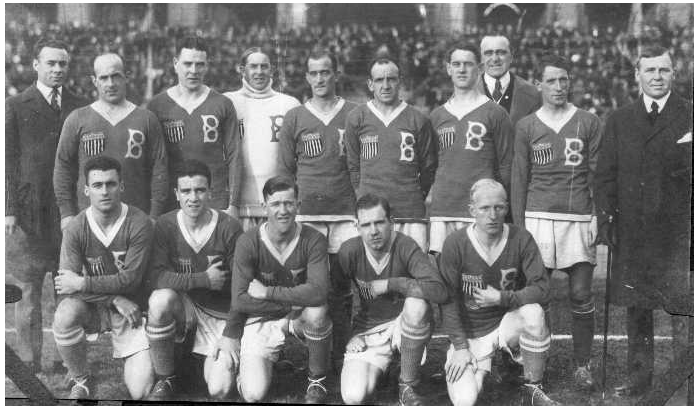 Six of the players who had appeared for the All-Philadelphia team — right fullback Bobby Bethune, left fullback Jock Ferguson, right halfback Billy Murray, left halfback William Porter, inside right Fred Morley, and center forward Harold Brittan — would form the core of the Philadelphia FC team that won the championship of inaugural 1921-1922 season of the American Soccer League. Also on the Philadelphia FC ASL team was outside left Tommy Fleming, and inside left William Forrest, two players who had been on the Bethlehem Steel team defeated by the All-Scots. A version of this article first appeared at The Philly Soccer Page on January 26, 2016. Ed was formerly the managing editor of The Philly Soccer Page. In addition to PSP and the SASH website, his work has also appeared at Philly.com, TheCup.us, The Encyclopedia of Greater Philadelphia, Centro de Investigaciones de Historia y Estadística del Fútbol Español, EPYSA.org, and in the 2011 MLS All-Star Game program. Email him at efarnsworth@phillysoccerpage.com. Follow him on Twitter at @FarnsworthPSP.